Soviet architecture owes its dimensions and originality not only to the talent of the architects, but also to the frequent and desperate inventiveness of its engineers and builders. RIR looks back at some of the boldest decisions taken by Soviet engineers when faced with tricky or apparently impossible architectural problems, decisions that helped produce, and preserve, some of Moscow's most important buildings of the last century. The practice of moving buildings in Russia existed long before the Bolshevik Revolution. A famous example took place in 1812, in the town of Morshansk in the Tambov Region, when a peasant carpenter by the name of Dmitry Petrov moved a wooden church several meters away from its original place in order to make room for a new stone shrine after it was decided not to demolish the old church, simply to move it. However, until the first third of the 20th century there were few such examples. The practice became very common in the Soviet era, when new buildings and neighborhoods were built on a large scale in the capital and in the smaller industrial towns. In 1935 in the town of Krivoi Rog (in central Ukraine) a one-ton building was moved by 250 meters because it had stood on an ore mine. A year earlier a two-story, 1,300-ton building had been moved in the town of Makeyev, in the Kursk Region south of Moscow. The first building to "relocate" in the Russian capital was a small two-story electrical substation near Tverskaya Street that was moved by 25 meters in 1935. The project director was Emmanuel Gendel, who subsequently became the USSR's leading specialist in moving buildings. Almost 10 buildings were relocated in the capital in the 1930s. The most interesting thing was that the residents were not resettled during the relocation and that all the engineering communications continued to work as normal. Technically, the procedure was carried out in the following manner: Steel tracks were laid along the perimeter of the foundation and then special orifices were made through which crossties and rail tracks were placed. The building was then moved on the rail tracks in the necessary direction. This technique helped save many pre-revolutionary buildings, which, according to Stalin's general plan for rebuilding Moscow in 1935, were earmarked for demolition. 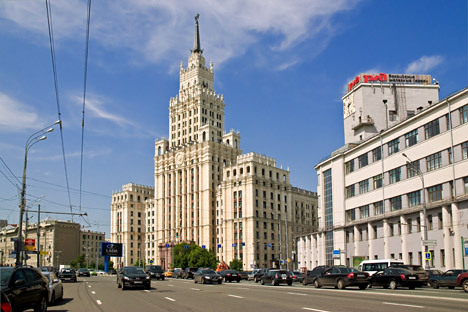 In 1936 an organization was set up that would be responsible for moving buildings, including the Mossovet building (the Moscow Soviet of People's Deputies) on Gorky Street, the Moscow Art Theater on Kamergersky Lane and the residential building on Serafimovich Street. One of the last relocation projects were the two Research Institute buildings, moved during the construction of Komsomolsky Prospekt in the late 1950s. Engineer Viktor Abramov and architect Alexei Dushkin conducted a unique experiment by constructing the high-rise near Krasniye Vorota between 1947 and 1952. The 138-meter skyscraper was built at the same time as the entrance vestibule for the 24-meter-deep Krasniye Vorota metro station. Due to the weight of the construction, the high-rise would have inevitably tilted to the side as a result of subsidence, since the deep pit for the metro exit was excavated right under its foundation. Ideally, the construction of the vestibule had to be completed first, then the ground had to be leveled and only then could the building be constructed. But since there was no time for this, the engineers decided to artificially freeze the ground (such a method was also used for constructing certain sections of the metro system) and erect the building's metallic framework with a 16-centimeter inclination in the opposite direction. As the ground melted the building subsided and gradually assumed a vertical position. The slightest error in the engineering calculations could have led to the complete collapse of the skyscraper. The trench method of constructing metro tunnels, which was used for the creation of the first Moscow lines in the mid-1930s, was an updated approach to the cut-and-cover method used to build the oldest tunnels on the London Underground in the 1860s. "Since the metro had to run right under the residential buildings of Volkhonka [Street] and the Arbat, the constructors decided not to create shallow tunnels [the ground itself prevented the boring of deep tunnels here], but to excavate trenches," says engineering historian Airat Bagautdinov. "Two reinforced concrete walls were made in the ground with an overlap placed between them. Thanks to such strengthening, the building that was raised on this underground vault would never collapse." All work was done by hand, with the aid of shovels. The first areas of the tunnel were laid between the Kropotninskaya and the Biblioteka Lenina metro stations, and from Alexandrovsky Sad to Smolenskaya. But this practice was soon abandoned and the first deeply excavated stations began to appear in Moscow shortly afterward.